Vega, sometimes also called kappa, is the measure of how sensitive the option price is with regards to changes in volatility. Vega is a very important risk metric, since your estimation of the future volatility is never exact. 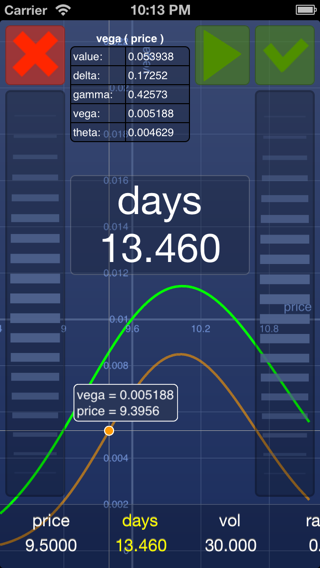 By looking at vega you can tell how much you can lose (or gain) if your volatility predition is wrong by one percent. A position with low vega is not very sensitive to volatility and even a large error in your estimation will not lead to drastically different results. On the other hand, high vega means that you should be very careful when estimating the future volatility. Vega decreases as options move away from being at the money and as expiration approaches. The study graph shows how vega changes with the base price.